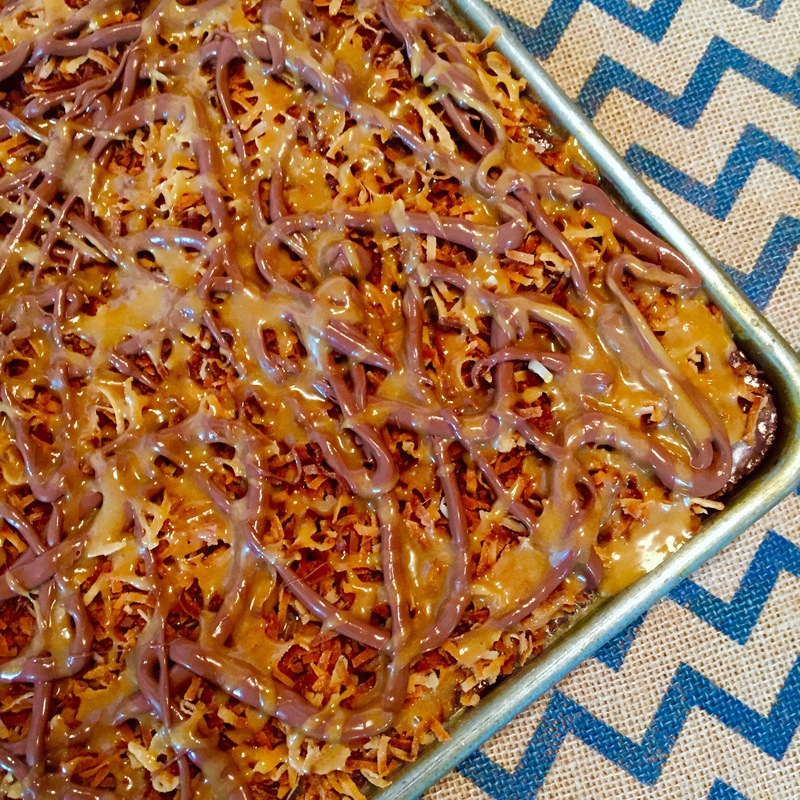 Treat for my son in law Jaren who passed a test with flying colors so I said I would make him a treat of his choice and he asked for something Samoa, when I saw this cake on “Chef In Training”, I knew it was the one! It’s not difficult to make but there a few steps that make it a little time consuming. I can’t tell you how it tastes because I took the whole cake over to Jaren and Courtney, they said they might share today so here’s hoping! 1 To toast the coconut, line a large (18 x 13 x 1″) jelly roll pan (cookie sheet with sides) with foil and spread coconut evenly on sheet. Bake at 375 for 10 -15 minutes, checking and tossing regularly, every 2 – 5 minutes, to make sure it toasts evenly and doesn’t burn. Coconut is done when it is golden brown. 2 To make the cake, combine flour and sugar in a large mixing bowl and set aside. 3 In a medium saucepan, combine butter, water, cocoa and shortening and bring to a boil then add to flour mixture and stir to combine. 4 Add buttermilk and stir, then baking soda and stir, then eggs and stir, then vanilla and stir. 5 Pour into greased large jelly roll pan and bake at 400 for 20 minutes. 6 For frosting, bring butter and milk to a boil in bowl in microwave. Stir in caramel sauce and then powdered sugar and vanilla, stir until smooth. 7 After cake is done, poke holes all over top of hot cake with a fork. Pour frosting evenly over top. Immediately sprinkle with toasted coconut. 8 Cook caramel and evaporated milk on high in 30 second increments in microwave, stirring between each increment, until caramel is smooth then drizzle over coconut. 9 Melt chocolate chips and shortening or oil in microwave on high in 30 second increment, stirring between each, until chocolate is melted then drizzle over caramel. 10 Let cake sit until both caramel and chocolate are set.